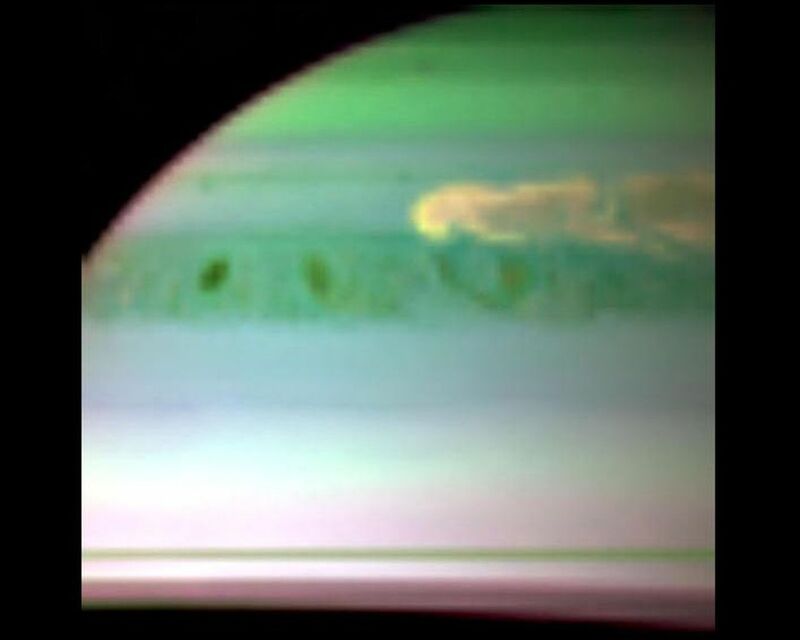 This false-color infrared image, obtained by NASA's Cassini spacecraft, shows clouds of large ammonia ice particles dredged up by a powerful storm in Saturn's northern hemisphere. Large updrafts dragged ammonia gas upward more than 30 miles (50 kilometers) from below. The ammonia then condensed into large crystals in the frigid upper atmosphere. 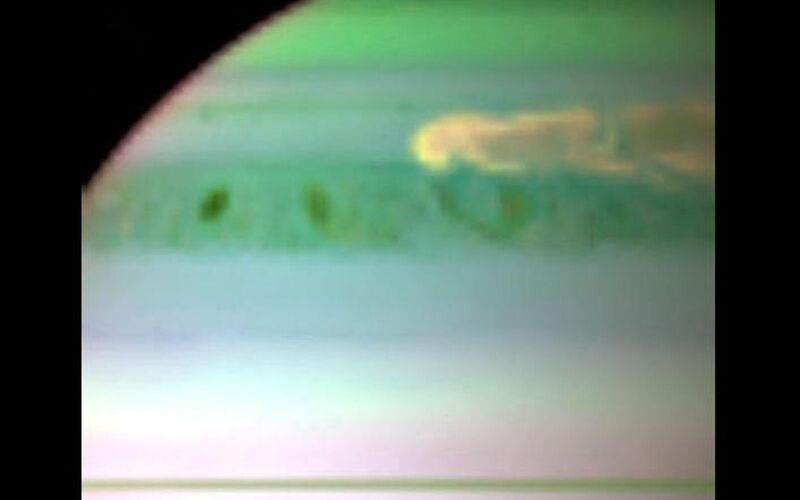 This storm is the most violent ever observed at Saturn by an orbiting spacecraft. 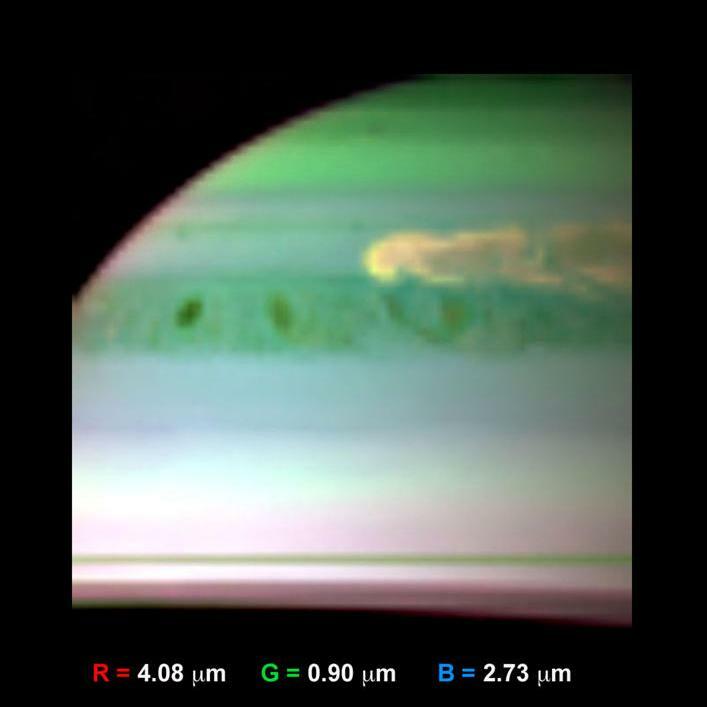 Cassini's visual and infrared mapping spectrometer obtained these images onFeb. 24, 2011. Scientists colorized the image by assigning red to brightness detected from the 4.08-micron wavelength, green to brightness from the 0.90-micron wavelength, and blue to brightness from the 2.73-micron wavelength. Large particles (red) reflect sunlight well at 4.08 microns. Particles at high altitude (green) reflect sunlight well at 0.9 microns. Particles comprised of ammonia -- especially large ones -- do not reflect 2.73-micron sunlight well, but instead absorb light at this wavelength. The storm here shows up as yellow, demonstrating that it has a large signal in both red and green colors. This indicates the cloud has large particles and extends upward to relatively high altitude. In addition, the lack of blue in the feature indicates that the storm cloud has a substantial component of ammonia crystals. 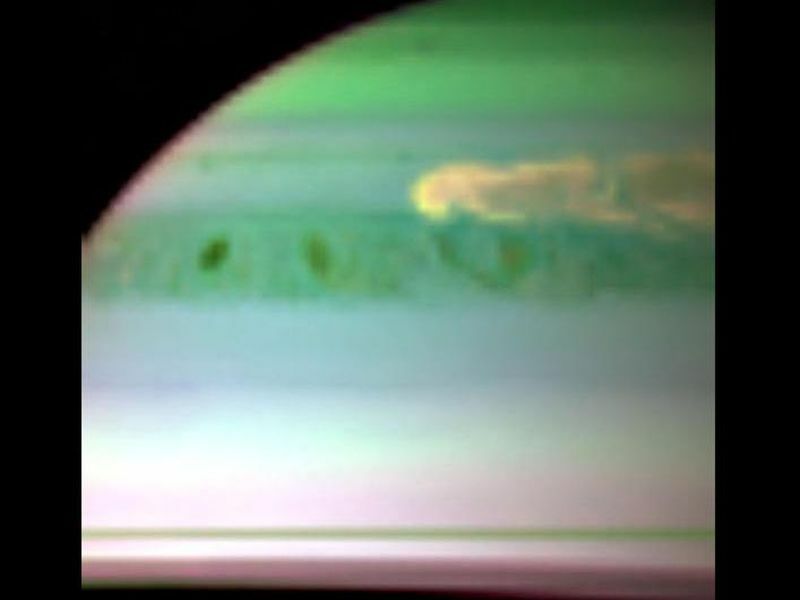 The head of the storm is particularly rich in such particles, as created by powerful updrafts of ammonia gas from depth in the throes of Saturn's thunderstorm. The Cassini-Huygens mission is a cooperative project of NASA, the European Space Agency and the Italian Space Agency (ASI). NASA's Jet Propulsion Laboratory in Pasadena, Calif., manages the mission for NASA's Science Mission Directorate at the agency's headquarters in Washington. The Cassini orbiter was designed, developed and assembled at JPL. The visual and infrared mapping spectrometer was built by JPL, with a major contribution by ASI. The visual and infrared mapping spectrometer science team is based at the University of Arizona, Tucson. JPL is a division of the California Institute of Technology in Pasadena.